The fourth-year running back has been elevated to a higher role and has been a multi-dimensional weapon for Cincinnati during the past few weeks. Even though Cincinnati is officially out of the 2016 playoff race, there are promising signs that a rebound can quickly be had as soon as next season for the Bengals. One such sign is the depth at certain positions on the roster—including running back. The Bengals currently employ four talented players in the group, but really only two at any given time receive significant snaps on offense. Because of a season-ending knee injury to Giovani Bernard, suffered in Week 11 against the Bills, Rex Burkhead has seen more time with Jeremy Hill at running back. Even though the Bengals went 2-2 since the loss of Bernard, with the two losses coming against divisional foes, it isn’t because of a lack of production from Burkhead. 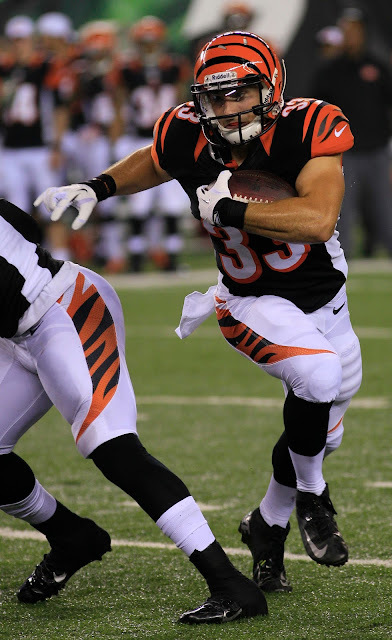 Every week we talk about a Bengals “Unsung Hero” and this week, Burkhead gets the nod for his efforts in the 24-20 loss against the Steelers. But, this post is looking beyond just this week. Burkhead has become the multidimensional guy the team has needed with Bernard’s similar skill set out of the lineup. In the four weeks since Bernard’s injury, Burkhead has 28 carries for 144 yards (5.1 yards per carry), along with 10 catches for 85 yards. This week, the Bengals surged to a 20-9 first half lead against Pittsburgh, using sound run plays and chain-moving passes. Burkhead was a part of both efforts, finishing with 50 total yards (32 rushing and 18 receiving) on nine total touches. In the second quarter, the Bengals were driving to what would become a field goal, which would give the Bengals a 20-6 lead at the time. It’s important to note that the drive was set up by an Alex Erickson 72-yard kickoff return. On second-and-10, Burkhead read a hole up the middle and shot through for a much-needed 9-yard gain. On the subsequent play, Burkhead had a 10-yard outside run, as well as a 4-yard scamper. Drives like these harken back to Burkhead’s days at the University of Nebraska where he was one of the better all-around college players from 2010-2012. The above-noted play shows quickness, shiftiness, ability to read the proper hole and even the ability to break a tackle in the open field. As a receiver, Burkhead remains a dangerous threat to opposing defenses. For the second time in as many videos here, Tyler Boyd lines up in almost an H-Back type of spot, while this time, Burkhead runs a route. He beats Lawrence Timmons for an 18-yard gain after Andy Dalton used him on the play-action. Have you guys been introduced to the Bengals best running back? It’s pretty troubling that the Bengals abandoned the use of Burkhead as a running back in the second half of the game, as he was doing far better than Hill. Against the Steelers, Burkhead averaged 4.57 yards per rushing attempt while Hill had a putrid 2.15 yards per attempt. Why the Bengals used Burkhead for just 7 rushing plays is troubling, especially after Hill left the game appearing hurt, but then returned. If we’re pointing out the recent good with Burkhead, we have to also look at a little bit of a shortcoming. One of Bernard’s unheralded strengths, especially this season, has been in his pass-blocking ability. Unfortunately, this trait hasn’t consistently carried over to Burkhead. If you're gonna chip a pass rusher on your way out, do it properly. No half measures from Tyler Eifert here. Obviously, Pro Football Focus’ Ben Stockwell is pointing out the positive with Tyler Eifert, but as you look at the video, a couple of things stand out. Overall poor blocking aside, Burkhead got floored by Timmons, causing Dalton to make a throw off of his back foot. Burkhead is an unrestricted free agent after this season. While he’s valuable and athletic, it’s hard to see the Bengals spending any kind of significant money on a guy who will once again be their No. 3 running back. Remember, Hill is under contract through 2017 and the Bengals just signed Bernard to a long-term extension back in the spring. Furthermore, Burkhead might want a more significant role with another club and other teams might view him as a viable No. 2 running back and kick returner. 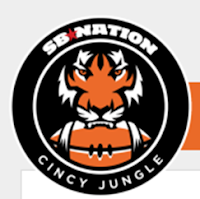 The Bengals haven’t shown they’ll do that when Hill and Bernard are healthy. When you look at his career stats, they aren’t gaudy enough to warrant a decent contract on the surface, but he’s made the most of limited opportunities. With 4.5 yards per carry and 6.0 yards per reception, he might demand unexpected interest on the open market. When we talk about the overall roster talent, impending free agents like Burkhead point to a double-edged sword. When you draft and groom solid talent, the possibility of losing another good player after a short stint with the team definitely stings. Unfortunately, this issue has been a big part of the formula for a 5-8-1 record through 15 games this year, after significant talent left in free agency last season. It seems the Bengals could be in for another round of free agent departures in just a few months.